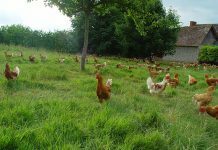 All poultry operations are under a constant threat from the ever-present enemy of disease and infection. It is imperative in all operations that we teach our staff how to reduce potential risks as far as possible. In this article, the Author explains how diseases are transmitted and how you can reduce the risk of human transmission. 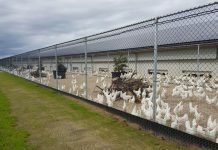 One of the greatest risks to any poultry operation is the risk of contamination of disease. This not only depletes production, but can also damage the reputation of the company. The transmission of disease can be spread in two ways. 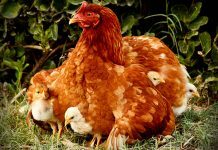 Firstly, disease can be spread vertically when bacteria such as salmonella and mycoplasma, or viruses like avian influenza etc., are spread already in the oviduct of the hen laying the egg. This means that the developing embryo will already be infected during development. The second type of infection is through horizontal transmission which can be from bacteria spread by a vector, which could be anything from airborne dust particles, animals frequenting livestock (beetles, rats, birds etc. ), equipment that moves from infected stock to clean stock or the action of people transmitting disease to your stock. It is this ‘human risk’ we will cover in this article. Mycoplasma is one of the main culprits of infections. It is a bacteria that can be transmitted both vertically and horizontally and which is able to survive for up to four days off its natural host. Therefore it has huge potential to jump from one location to another. A thorough ‘showering in’ regime (staff that enters should take a shower) and change of clothing should greatly reduce the risk from mycoplasma being brought in by personnel. 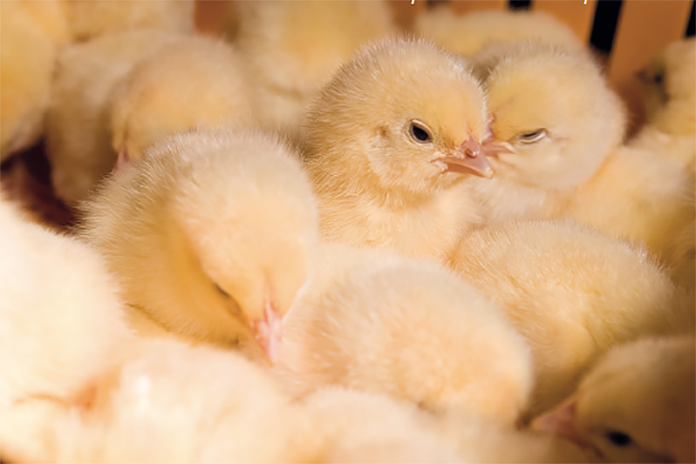 Salmonella is another prime issue in poultry. This can also be spread both vertically and horizontally, but can also easily infect people. Breeding stock operations should have routine testing of staff and visitors. Low pathogenic strains can result in low impact on stock. However, strains of H5 and H7 have the potential to mutate from low pathogenic to high pathogenic which can wipe houses and can also infect other species including humans coming into contact with it. 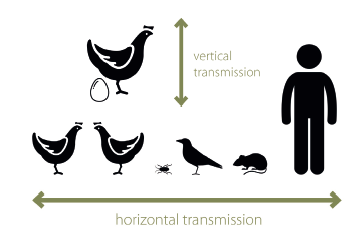 Avian influenza can also be transmitted both vertically and horizontally. These are just three potential risks but there are many others too numerous to go into during this discussion. All employees of a poultry operation should have an understanding of bio-security, as it is not only production workers that could be vectors for disease entering an operation. Likewise, any visitors are potential risks to the operation. When it comes to external visitors, the golden rule is: ‘if they do not need to be there, they should be kept out’. Visitors should be screened prior to entering the site. 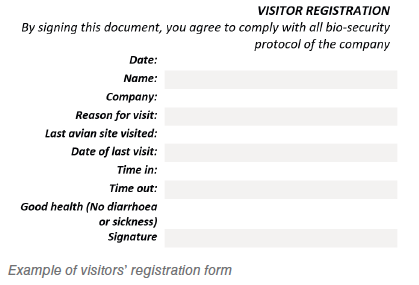 On entering the site, visitors should fill in a visitors’ record explaining why they are there, date of their last contact with poultry and where, and sign a good health declaration. Visitors should also receive explanation receiving the bio-security regulations. They should understand where they can and cannot go and sign to say they will adhere to the rules. On entering an operation, all visitors should shower in to eliminate the risk of bringing in bacteria. 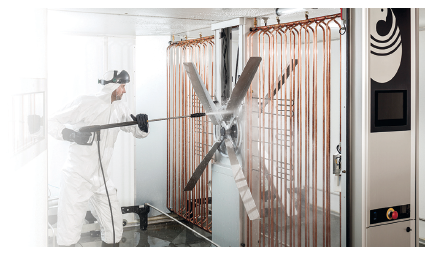 Equipment can also be sterilised with UV chambers or disinfectant sprays. 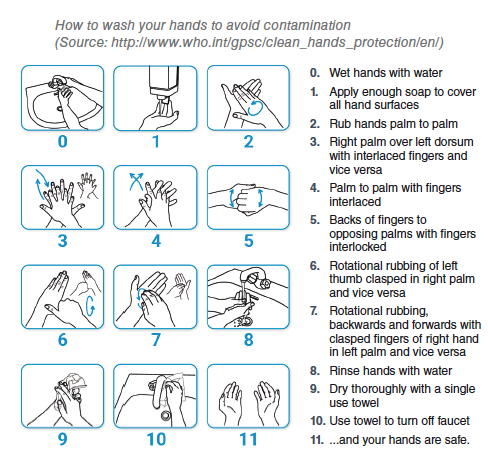 Once inside, good hygiene must be adhered to washing hands after eating or going to the toilet for example. Use of hand sanitisers in every area around the operation is also good practice. 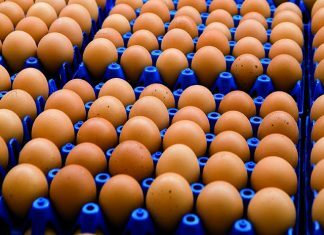 In the hatchery, it is also advantageous to keep staff to either egg side (‘clean’) or chick side (‘dirty’). This is to avoid chick fluff cross contaminating other ‘clean’ areas. This can be helped by giving each area a designated colour of clothing. 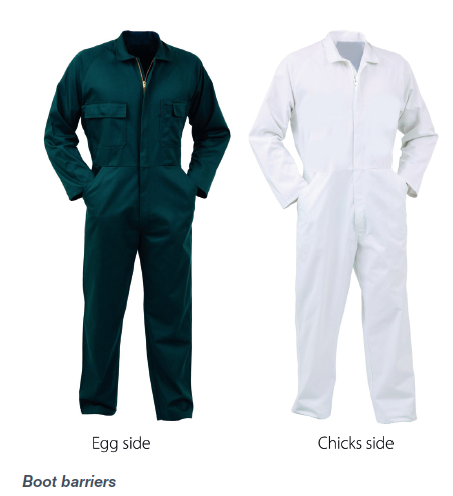 For example, blue clothing for the egg side and white clothing for the chicks side. 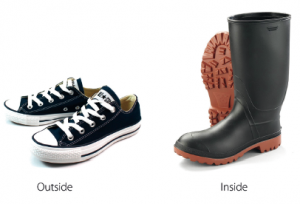 One of the continuous vectors of transmission comes from the soles of shoes worn outside and worn into an operation. The most effective way to eliminate this risk is with physical barriers and a complete change of footwear, commonly referred to as ‘boot barriers’. Keeping disease out from livestock operations will always be a great challenge. One that can only be achieved with cooperation of all involved. It is imperative we all keep vigilant and report any non-compliances to safeguard our operations and to ensure continuous supply to our clients.